Still sorting out old boxes and beneath that run of Fury I uncovered another Marvel weekly that I hold in great affection - The Super-Heroes. Marvel had hit on a formula of 36 pages, glossy colour cover, black and white interior for their British reprints and in March 1975 obviously felt comfortable enough to add another two titles to their stable. Marvel Zombie me would buy anything. If you read the letters pages back then, a common chant was “When are you doing the X-Men? When are you doing Conan? When are you doing the Silver Surfer?” And that week we got what we asked for. Waiting in the newsagent along with MWOM, SMCW, A/MKF, POTA and DL we suddenly had SSC and SH. Think I need more pocket money. The Conan title featured, quite naturally Conan the Barbarian and King Kull. The first issue gave us a poster of a Neal Adams painting that graced the cover of the US Savage Sword of Conan. Things obviously didn’t go quite as planned because after 18 issues it became the first Marvel UK title to bite the dust - abruptly it was merged with The Avengers. It would be ASSC for the next 50 weeks. Savage Sword of Conan’s sister title seemed to fare better. The Super-Heroes gave us the Silver Surfer and the X-Men - but you might detect a problem here. At the time both parent comics in the States were dead. All the other reprint titles had an ongoing supply of material to plunder. If you were able to find a US X-Men comic it was a reprint title itself. Coincidentally, both strips had been printed in the UK before. They had the inevitable Alan Class reprints, the X-Men had been a headliner in the late-lamented Fantastic while the Surfer had a peculiar role in the painful demise of TV21. I suppose the Surfer could have given way to The Defenders but a clear end marked these two strips out from the Marvel weeklies. Still, for the moment we were happy getting a regular fix of mutants and cosmic tragedy. A slight change came with the 23rd issue when Doc Savage joined the line up. The George Pal movie was playing in cinemas and it must have seemed a good chance to get in some advertising dosh. For the next five weeks we had adventures with the Man of Bronze as drawn by Tony DeZungia. It did mean a smaller portion of the Surfer though. On the sixth week they slipped in This Badge Bedeviled by Len Wein, Gary Friedrich and George Tuska (which I believe comes from Astonishing Tales #8). After that a couple of issue swapped the status quo, a large chunk of X-Men, small Surfer. The X-Men even got a cover out of the shuffle. For some reason the Surfer didn’t receive a chronological run in The Super-Heroes. They didn’t factor in the Lee-Kirby Quasimodo story from Fantastic Four Annual #5 and Kirby’s closing issues pitting Norrin against the The Inhumans and ending on the promise of a “Savage Silver Surfer” appeared earlier in the run. Instead a Lee-Buscema clash between the Surfer and Human Torch was used to close the run of cosmic adventures. After 30 issues that was it for the Surfer. So what next? Those were some mighty big boots to fill. Why not stick in two great new features to replace the revered one that has come to an end ? With issue 31 we were introduced to The Cat and err, Ant-Man? All good stuff. For some reason Greer Nelson was given a green costume for her UK cover appearances (apart from one issue). 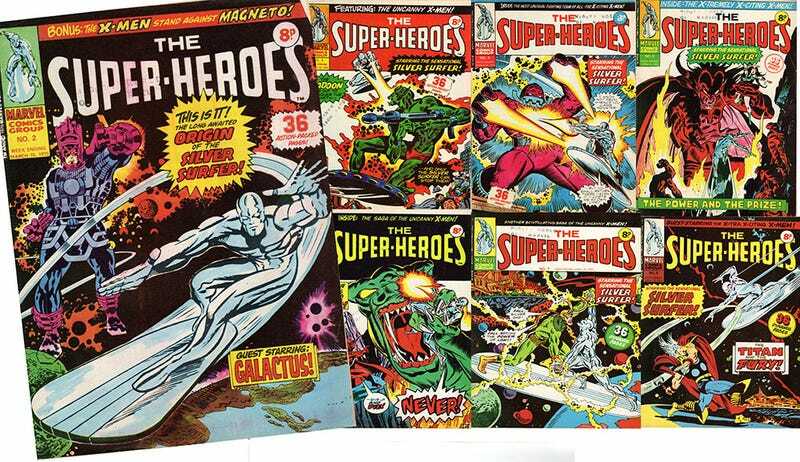 Except, despite the cover we didn’t get the early Ant-Man, those astonishing tales wouldn’t each us until Hulk Comic entered the fray. Instead they jumped straight in with the origin of Giant-Man. Giant-Man and the Wasp was another Power Comic/ Alan Class alumni, but his spell in Terrific was ancient history. The Claws of The Cat was one of those titles that had zilch in the way of UK distribution but teased us from Bullpen Pages in Marvel comics that did reach us. The Cat was more boobilicious than some other feline superheroines around at the time but again was something with a limited lifespan. That was extended by the subtle use of a Marvel Team-Up yarn. Added Spider-Man is always a good thing. Just like that The Cat was gone. And just to make life interesting, at the same time The Super-Heroes lost its merry mutants. The X-Men jumped ship and for some reason were bounced over to become the headline feature in the revolutionary landscape comic, The Titans. Talk about musical chairs! I don’t think that lasted long? Around this time, a spot ad promised that Bloodstone, The Scarecrow and Phantom Eagle were coming to The Super-Heroes. Well, we got Bloodstone and The Thing (in stories from Marvel Feature/Marvel Two-In-One). When Bloodstone came to an end, The Scarecrow moved in, then The Black Knight in a solo outing from Marvel Super-Heroes #17. We didn’t get the Phantom Eagle though. At least not in The Super-Heroes. With issue 50, in February 1976, The Super-Heroes closed its doors and was merged with SMCW. If anything crossed over, it was The Thing. My memory is fuzzy on that. Post merger came a second landscape comic - Super Spider-Man and The Super-Heroes or SSMTSH if you prefer.